České Budějovice is the capital city of the South Bohemian Region. It is internationally famous for its beer, known in other countries as Budweiser, after the German name of the city: Budweis. The city also played a role in one of the greatest works of Czech literature: The Good Soldier Švejk (in the original: Osudy dobrého vojáka Švejka za světové války). If you haven’t read The Good Soldier Švejk: the novel’s protagonist was a soldier in the Austro-Hungarian army during World War I. He missed all trains going to České Budějovice, where he was supposed to join his regiment. Švejk sets out on foot, but he never reaches his destination, because he gets captured before that and is escorted to his regiment as a suspected spy or a deserter. České Budějovice was founded by King Ottokar II of Bohemia (known in Czech as Přemysl Otakar II) in 1256. He also granted the city brewing rights a few years later, so the history of beer in České Budějovice dates back to the 13th century. The famous Budweis brewery, known in Czech as Budějovický Budvar, was founded by local entrepreneurs in 1896. Nowadays, the brewery is state-owned. It is possible to book a tour of the brewery and the commentary is available in several languages. In the European Union, Budweiser beer has a Protected Geographical Indication status. It means that this beer can only be produced in České Budějovice. It is illegal to produce it elsewhere and it is not possible to obtain a license allowing to do so. This doesn’t stop people from trying; there have been reports about confiscating counterfeit Budweiser beer in Asia. Another matter is the century-old legal dispute about the Budweiser trademark with the American corporation Anheuser-Busch. The American brewery lost the case in the courts of the European Union, which means they can’t use the trademark in most EU countries and they market their beer instead as “Bud”. On the other hand, the Czech brewery must sell their beer as “Czechvar” in certain overseas markets. Beer is an important source of revenue for the city, but České Budějovice has much more to offer to tourists. The Old Town covers a relatively large area and it contains an interesting mix of architectural styles. The centre of the Old Town is the beautiful Přemysl Ottokar II Square (Náměstí Přemysla Otakara II). It is the second largest square in Czechia, after the one in the town of Vysoké Mýto, in the Pardubice Region. The southern side is 132.5 m (434.7 ft) wide and the width of the northern side is 137.4 m (450.78 ft), which means it is not a perfect geometric square, but quite close. A highlight of this square is the impressive town-hall (radnice). The previous town-hall had been damaged in a fire in the 17th century, and in the first half of the 18th century it was rebuilt in the Baroque style. The author of the design was the Austrian architect of Italian descent Anton Erhard Martinelli and the construction work was supervised by Pavel Kolečný from Třebon. The town-hall has three spires and the central one is decorated with a clock. The façade is embellished with coats of arms of České Budějovice and the lands of the Bohemian Crown. 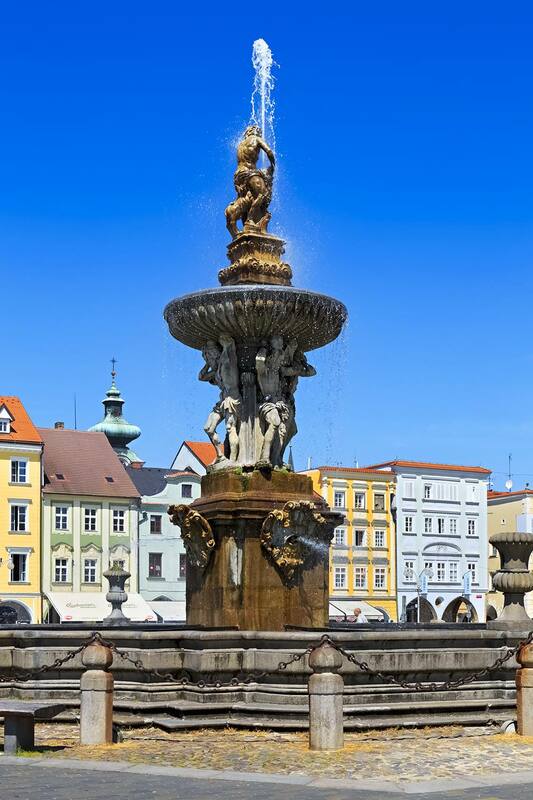 Another highlight of Přemysl Ottokar II Square is the Fountain of Samson (Samsonova kašna). It was created by the Bohemian sculptor Josef Dietrich and the stonemason Zachariáš Horn during the reconstruction of the town hall in the early 18th century. The main statue depicts the biblical Samson on a lion. In the 1990s, the original statues were replaced by copies and moved to the town hall for protection, where visitors may still see them. The fountain is illuminated at night. It is considered a symbol of the city. 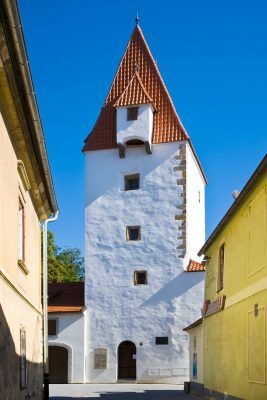 The Black Tower (Černá věž) is located not far from Přemysl Ottokar II Square and because of its height of nearly 72 m is very easy to notice and to find. 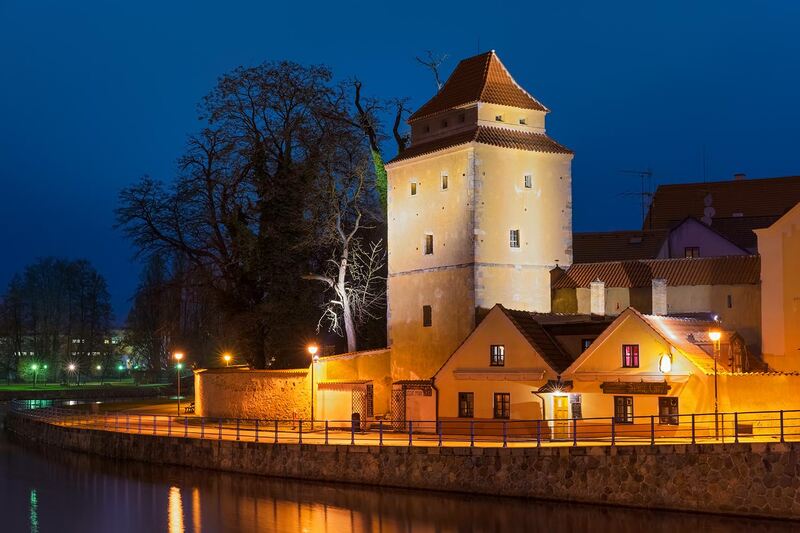 It was built in the 16th century and served as a watchtower and a bell tower. There are seven bells in the tower and their names are: Budvar, Bumerin, Maria, Marta, Oktava, Stříbrný and Umíráček. In the warm season, the tower is open to the public and can be climbed. The Cathedral of St Nicholas (Katedrála svatého Mikuláše) is the main Roman Catholic church in the city. It is located in the center of the city, next to the Black Tower. As a matter of fact, the Black Tower was used as a bell tower for the cathedral. The construction of the church was started soon after the foundation of the city and was completed probably in mid-14th century. Its current Baroque appearance the cathedral owes to the reconstruction in the 18th century. The Iron Maiden Tower (Železná panna) is a Gothic tower which used to be part of the defensive walls of the České Budějovice. 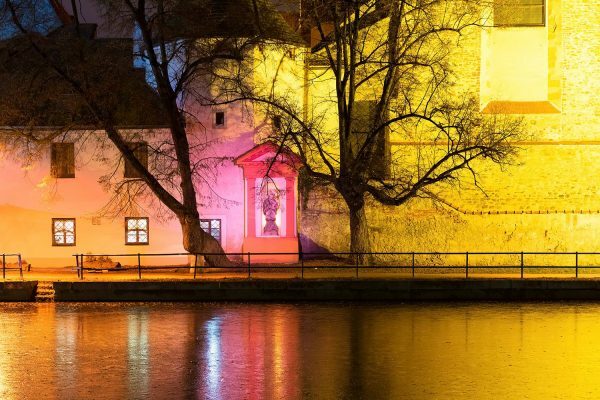 It was built in the second half of the 14th century and is located on Zátkovo nábřeží Street, near the confluence of the Malše river into the Vltava. Nowadays, there is a restaurant serving Czech cuisine inside the tower. No, the tower wasn’t named after the English band, but after the medieval torture device, which had allegedly been used in there. The English band was also named after this rather cruel device. You won’t need to go to České Budějovice in Švejk style, even if you miss a train. The city is well connected with the rest of the country. There are frequent direct bus and train connections from Prague. Certainly, more frequent and more convenient than in the times of Josef Švejk. Typical journey times by an express train are around 2 hours, and if you take a fast train (rychlík) that would be around 2.5 hours. Direct buses from Prague – Na Knížecí are operated by RegioJET/Student Agency and the journey time is around 2 hours 15 minutes. If you’re based in Prague, you can easily visit České Budějovice and return on the same day. If you’re coming from Brno, the journey will take considerably longer, about 4 hours 20 minutes by train, or 3 hours 40 minutes by bus. 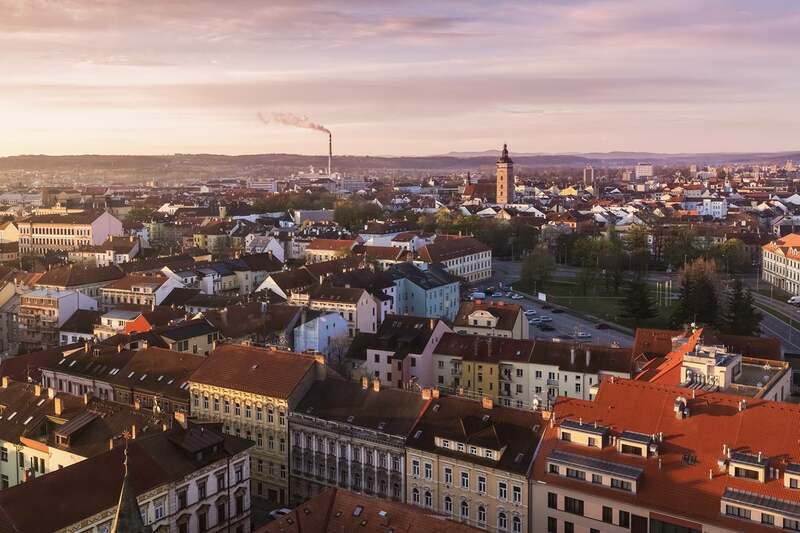 You can also easily get to České Budějovice from Linz in Austria. By train it typically takes a little more than 2 hours, and by bus a little less than 2 hours. There is an airport in České Budějovice. In the past, it only handled small aircrafts, but it is currently undergoing modernization. After the work is completed, the airport should handle regular passenger flights. At the time of writing, it is unknown when exactly the airport will be re-opened and what connections it will offer. 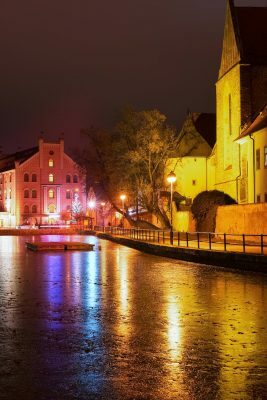 Obviously, it won’t compete with the airport in Prague in terms of the number of connections, but it should offer additional convenient options for foreign travelers who would like to explore South Bohemia. Are you planning to stay in České Budějovice for a few days? Hotel Budweis is a fantastic accommodation option in the very centre of the city. It is a new, 4-star hotel, just a few steps away from the central square. Some of the rooms offer views of the confluence of the Vltava and Malše rivers. Check the availability and book your room. Grand Hotel Zvon is a superb hotel right at the central square of České Budějovice, so guests can enjoy magnificent views from some of the rooms. It is believed to be one of the oldest hotels in Czechia, with traditions dating back to the 16th century. The rooms are quite spacious and have minibars. Check the availability and book your room. Clarion Congress Hotel České Budějovice is another popular accommodation option in the city. It is located within walking distance of the historic centre. It is a 4-star hotel housed in a high-rise building, so some of the rooms on higher floors will offer nice panoramic views. The hotel's restaurant serves Czech and international cuisine. Check the availability and book your room.